Where is it? : Aldinga Scrub is situated along the coastline between the townships of Aldinga Beach and Sellicks Beach. It is now surrounded by residential development. Public transport is available on Bus Route 750 (Colonnades Centre Interchange to Sellicks Beach) 0r 750X (Seaford Interchange to Sellicks Beach). Alight at either Bus Stops 127 or 128 on The Esplanade or Stops 130 or 130A on Norman Road for access to the park. Catch the train from Adelaide to Seaford. There is a small car park located on the corner of Fraser and Dover Streets. Access gates are situated at the corner of Wattle Avenue and Acacia Terrace, Quandong Avenue, Fraser Street, Boomerang Avenue and Cox Road. Property summary: Total area 266 hectares – Hundred of Wilunga, Section 821 and Allotments 14 and 15 (Deposited Plan 7147), 4 (Filed Plan 16369) and 100 (Filed Plan 29089). History: In the 1960s the Willunga Council became concerned that subdivision of the area would cause erosion. Between 1965 and 1982, 239 hectares were purchased at Aldinga to be managed by the State Planning Authority as an Open Space Reserve. In November 1985 the reserve was declared Aldinga Scrub Conservation Park. Smaller areas were added in 1991. 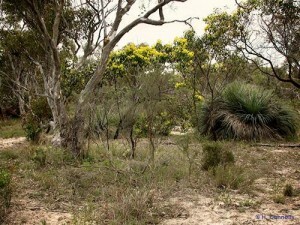 Habitat: The area contains sand dunes, sand blows (mobile dunes), mallee box (Eucalyptus porosa) woodland, remnant river red gum (E. camaldulensis) forests and closed heaths. There are areas of bracken (Pteridium esculentum) and tall shrubland dominated by Golden Wattle (Acacia pycnantha).